CD Review: Fleetwood Mac, "Rumours Expanded Edition"
An album you know by heart in a way you’ve never heard before. 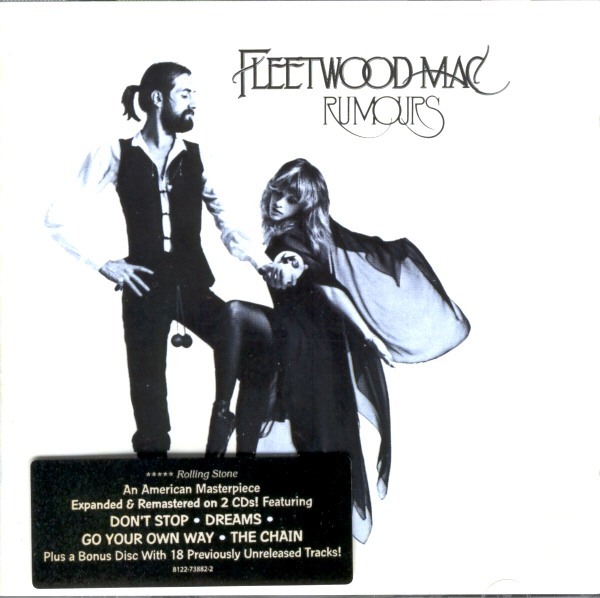 When approaching the reissue of an album of such a particular vintage as Fleetwood Mac’s chart-demolishing Rumours, I usually go quickly to the bonus tracks or the extras disc. After all, this is one of those records that everyone of a certain age owned, on multiple platforms. The gold has to be in the new material, the demos or the live set, right? Ordinarily that’s true, but Rumours happens to be that strangest of strange cases because rarely has a recording so beloved, so obsessed over through the years, sounded so utterly crappy on disc. Many of those first issued compact discs suffered from lousy digital mastering if any mastering tweaks were performed at all. The music itself was some of the most perfect pop to issue forth from the 1970’s but you could hardly hear it over the hiss, the murky reproduction, and the muted volume level that forced you to turn your own volume up louder, which in turn made the hiss even worse. Any improvement would have been welcomed, but I was unprepared for what came through the speakers when I test drove the new expanded edition of Rumours on CD. How about crisp delineation of every layer of “oohs” and “aahhhs,” Lindsey Buckingham’s acoustic guitar string ringing against a fret on the opening of “The Chain,” the depths of the bonzo-psychosis at the close of “Gold Dust Woman,” and hey, is that marimba I hear buried ever-so-carefully in “Dreams,” a song I’ve heard so many times I should have known all the instrumentation by heart already? There are cash-in reissues that claim to have had extensive remastering for the benefit of sonic clarity, and then there are those that prove it. Just listen to Christine McVie and her piano on “Songbird” for further evidence. You can hear her voice reflecting off the walls and not a mask of near-white noise. But there is, in fact, that second CD with a live set and a third with the demos and afterthoughts…all the tchotchkes that make this edition rightly titled “expanded.” There’s also the inclusion, on the main album where it always belonged, of Stevie Nicks’ killer “Silver Springs.” This is all great stuff. The reason to buy this, nonetheless, is that the Rumours coming out of the speakers is finally, finally, the one that has been in your head for decades. The album has the ability to put the lie to the thought that Tusk was Buckingham’s first real foray into using the studio as instrument. The crystalline tone coming off of the guitars, the deep underpinning of John McVie’s bass, and vocal harmonies tighter than drum-heads all in their time reveal this to be equally ambitious for audiophiles, without the manic itch Buckingham was experiencing on that storied follow-up. I have often ended reviews of reissues with a consumer reporter’s cynicism, saying the promises of bigger/better/cleaner don’t pan out and keep what you have. I can’t imagine offering that guidance when it comes to Fleetwood Mac’s Rumours Expanded Edition. If you must have this album, this is the only version you should be buying.